Since I now have a serger, one of my goals this year is to make some clothes for myself. I gave myself a deadline, asked some friends to hold me to it and I did it!!! 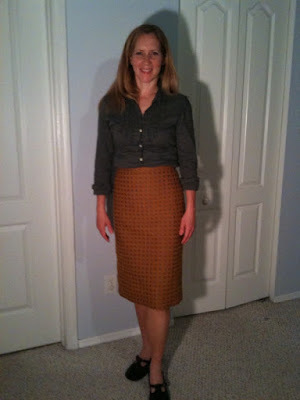 I made this little skirt to go with this cute shirt I got at old navy a couple of months ago. I originally planned on wearing it untucked but as I was finishing it up it was a little too boring (too me). Something else I'm trying to do is step it up a little in the way of fashion. So I tried tucking it in and here it is. It needed something though so before the skirt was officially finished tonight I ran to Target for a few accessories. After an hour of browsing, and at the last minute being intercepted by my friend Maria for a quick fashion consultation, I came back with this belt, shiny new patent ballet flats and a chunky black necklace. This shot as everything for the final look, man it is hard to get good shots. 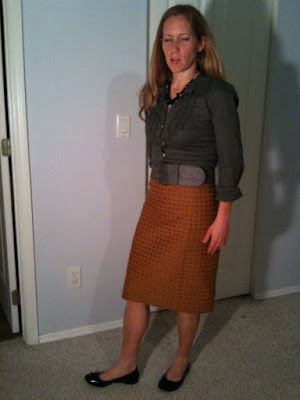 To make the skirt I made a pattern from one of my existing black skirt that I've had forever. I simply love the fit. It is tight and secure up top and is just the right length so when I sit my knees don't show much, so I'm not having to constantly pull it down when babies sit on my lap. It was pretty easy to put together. I put in my first invisible zipper, not sure I did it the way I was supposed to but it looks fine. Want to know how much this little outfit cost me? Grand total, $44 for it all. It was a seriously fun little adventure, and I have something new wear to church tomorrow. Now all I need are a few judges. Honestly what do you think?? I asked Doug, what he thought of the material, he said "It's great... if you like wearing a rug" But now I think the rug look has grown on him and he gives it the thumbs up. I think the modeling is my favorite! 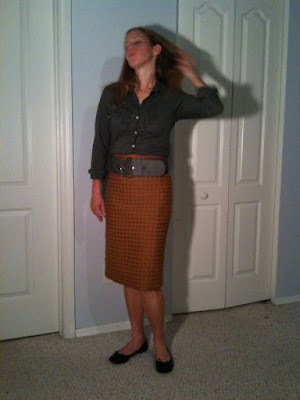 I really like the whole look - the skirt, shirt, belt, shoes, jewelry - all go so nicely together. Did you have a pattern you were working off of, or did you just come up with the pattern on your own? Well done!! Awesome job!! 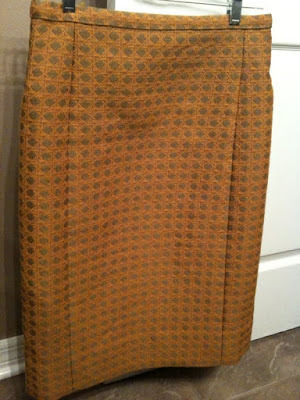 Thanks, I made the pattern from a skirt that I have. Yeah the modeling is awesome, huh? It looks awesome on you! Now I want to start making clothes for myself. I totally love it! I need some tips!